After a few month sabbatical from my gym routine, yesterday marked my return with a morning of treadmills and lifting. The light "getting back into it" workout felt great and today I have that wonderful "I did something good" feeling in my arms and abs. Definitely not wanting to "over do it", though (insert husband eye roll here! ), I decided to take today off instead choosing to walk the pups along the beach. With a nice breakfast of chicken and scrambled egg along with the usual dog kibble providing a good dose of protein for the pups I turned to Ellie Krieger to keep myself on track. Quinoa made its appearance in our home a number of years ago with our family enjoying the somewhat distinctive delicate flavors and slightly grainy texture. Frequently described as a grain, quinoa is actually the seed to a leafy plant distantly related to spinach. With a protein quality equivalent to that of milk and a good dose of manganese, magnesium, iron, copper and phosphorus, the seed packs a healthy punch in addition to providing a pleasing delicate, nutty flavor. Easily substitutable for most any other grain, this seed has earned a high place in my kitchen and has made its way to our table in the form of fresh summer salads, casseroles and soups. However, before this morning I had not thought of it for breakfast. 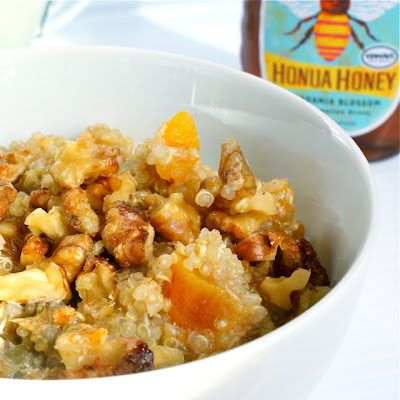 Ellie's Honey Harvest Quinoa brings some of our favorite breakfast ingredients to the table providing a somewhat sweet yet protein rich start to your day. Filled with nuts and fruits, honey and a touch of cinnamon this ancient seed fills my protein requirement in a very pleasing way. Versatility is the key to this breakfast dish with nearly any variation of the fruits, nuts and honey making it a new dish each time you serve it! Rinse the quinoa in a fine mesh strainer (see note below!). Place the rinsed quinoa in a saucepan with the water and bring to a boil. Reduce the heat to a simmer, cover and cook for about 6 minutes. Add the apricots and raisins and continue to cook covered over low heat until the water is absorbed, about 8 - 10 minutes more. Remove from heat and stir in the honey and cinnamon (adding more or less to your taste). Spoon into serving bowls, top with milk, walnuts and any additional topping you desire! Note: Quinoa's survival through the millennia may be attributed to the resinous, bitter coating that protects its seeds from birds and insects--and also shields them from the intense high-altitude sunlight. This coating, called saponin, is soapy and must be removed in a strong alkaline solution to make the grain palatable. Most quinoa sold in this country has already been cleansed of its saponin. But quinoa should be rinsed thoroughly before cooking to remove any powdery residue of saponin. Place the grain in a fine strainer and hold it under cold running water until the water runs clear; drain well. I like the sounds of this breakfast, sweet and filling! I'll have to get myself some more quinoa! I'm going to try this tomorrow instead of my usual winter porridge. I didn't know about the saponin - thanks for that and for a great new breakfast! This sounds amazing!!! 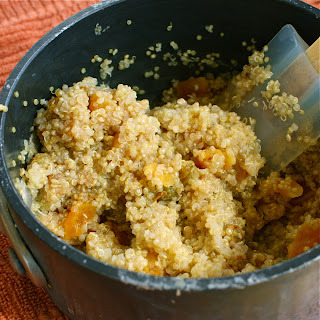 I love couscous with dried fruit and nuts but have not tried quinoa yet, so this is added to my list. Thanks for sharing! THis dish is one of the best quinoa dishes I've seen Kim! Thanks for sharing the recipe. And I know what you mean about getting back into the gym routine and feeling good. I just got back into it and loving it! Beautiful! I'll definitely try this in the weekend. Do you know how many servings does it yield? I know quinoa is quite filling! I've never seen quinoa look so yummy! I love love love the honey! Great job! Wow this looks good. I've never thought of making sweet quinoa or couscous. Funny thing, I started my workout yesterday too and I woke up feeling that sore.......kicked in the stomach kind of feel. Odd as it may be, it feels good:) I'm really new to eating quinoa and I love all the protein it has to offer. This looks like a great breakfast! I am all about quinoa!! LOVE it...but why don't I ever eat it for breakfast? I love quinoa but have never thought of using it for breakfast! Sounds delicious! It gives me the idea of replacing simple bread with this healthy quinoa recipe. Very glad you've shared something like this. Thanks for the post. I haven't rally cooked with quinoa very much, but this this looks so good. I know that it is good for you so I will have to pick up some next time I am at the store and give this recipe a try. I really need to get back to the gym too but I don't seem to have the motivation at the moment. Congrats on getting back to the gym, Kim! I love that feeling of a good workout over the next couple of days :-) The quinoa for breakfast thing is absolute genius! Talk about a nutritious start ;-) And a walk on the beach sounds absolutely great because we are being blessed with great weather these next few days! 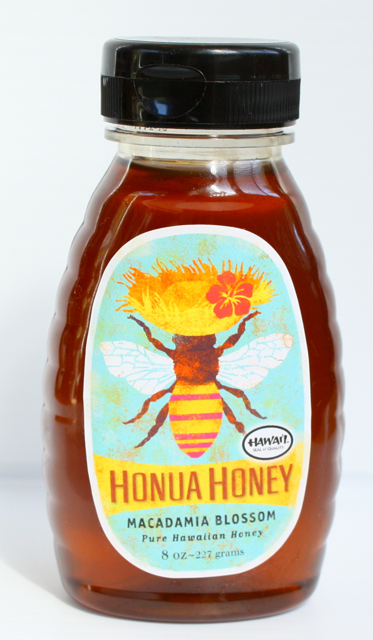 never tried honey with quinoa- must taste good, have to try out! thanks for sharing.. I've never had quinoa for breakfast, but this post is the first thing I saw when I got up this morning and now I want this for breakfast! I need a chef on call! Wow! I never would have though of quinoa for breakfast either! And the honey! I bet it was a great dish! I think I have to follow everybody's comment here. 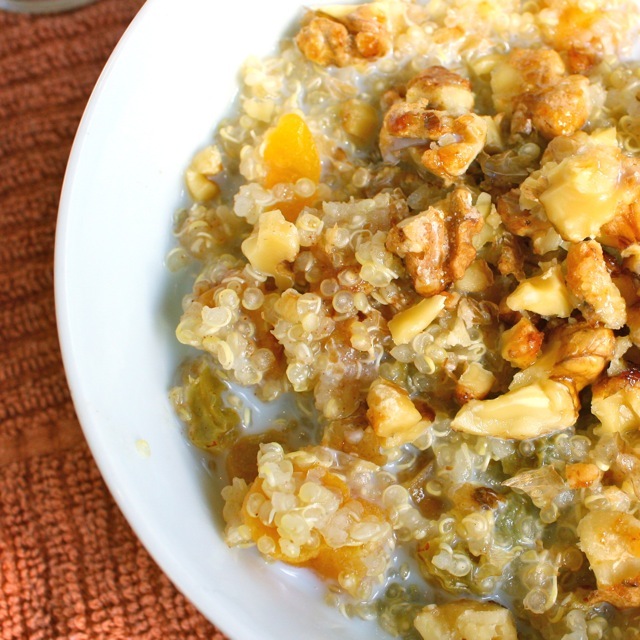 I had never thought of quinoa for breakfast but I'm so ready to try it! I love quinoa and I always find myself cooking it with the usual 2-3 recipes so I'm glad to have a new one. Good reward for going back to the gym...I have been off since the beginning of the school year auch! I love Ellie's recipes! This looks so good! This looks absolutely delicioius! perfect breakfast idea :) will try out! It's replacing my oatmeal with quinoa - I've never had it for breakfast and it's a natural. I will definitely be adding this to my morning repertoire. This looks fantastic. I just recently tried quioa and now want to give this recipe a shot! And, isn't the feeling of getting back into a workout routine the best? I have been experimenting and trying out alternatives to oatmeal for hot cereal in the mornings and I am a big fan of quinoa, it's got a great nutty taste! I've also tried Kamut and multi-grain cereals with wheat and barley and was pleased with those as well. What a delicious breakfast that would make. I am the only one in my family who would enjoy it, but that's all the more for ME!! Kim - I just used my $$ from your CSN giveaway and bought a reversible cast iron griddle/grill pan! I can't wait to use it...thanks again for the giveaway!! I love quinoa but never thought of using it in sweet treats. excellent idea Kim. send you a Foodbuzz friends request. I absolutely love sweet quinoa recipes for breakfast and this one looks like a real winner! I can't think of a better way to start the day! This is the first quinoa recipe that I've seen that I actually liked the look of. The way you've made it, it looks like the caviar of the grain world. I love it. i've been wanting to make this but never get around to it b/c i'm always scared that it's too hard to cook properly. do you have any tips? is it possible to make this quick? Today is my day to "get back into it". I am going to give this a try for breakfast tomorrow! Finally tried this. Five foot snow drifts have us blocked in, but at least the sun is shining. We are warm here enjoying this recipe for breakfast. Oh it's quinoa, at the beginning I thought that you've made a salad from caviar :), that's pretty interesting, I wonder how it tastes? I'm not a fan of goosefoots. Toasting the walnuts makes a world of difference in this recipe! As a huge fan of quinoa I was anxious to try this. Just finished eating it! I made exactly as written and then added a drizzle of lite maple syrup and it was yummy! Hopefully it will keep my tummy happy longer than oatmeal does as I'm hungry an hour after I eat oatmeal. I'm so glad you enjoyed it!! I've sort of forgotten about this dish, but it will be on our table again this week. Thanks for the reminder!! !